We start with the Bank of Japan, where unlike recent snoozers, Tuesday's announcement will warrant greater attention following recent speculation in the media about whether we'll see a tweak in the yield curve targets. Despite rumors it could soon unveil a plan to eventually adjust its stimulus by revising the 0% target fof 10Y JGBs, all 44 economists surveyed by Bloomberg predict the Bank of Japan will maintain the current setting on interest rates, while Governor Kuroda is set to unveil fresh inflation forecasts, which the press has leaked will be in a downward direction. An increase in the JGB yield target appears unlikely at a time when it is expected to revise downward its inflation forecast. According to Deutsche Bank, the BoJ will declare at the end of its statement that, based on its analysis in its quarterly Outlook Report, it will maintain its easing policy for an extended period "but will conduct financial market operations and asset purchasing operations to address the mounting cumulative side effects." One likely adjustment is that the BOJ will overhaul its ETF purchasing operations (by shifting from Nikkei 225-linked ETF to Topix-linked ETF, leading to potential weakness for the Nikkei). The Fed will likewise not announce any change in policy given that this is not a meeting that includes a post-meeting conference or a fresh summary of economic projections. However in light of the recent escalation in trade war, it'll be interesting to see the Fed's updated views. Recent comments from President Trump about Fed policy shouldn't however have any impact on the Fed's approach to monetary policy. Moving on to the BOE, for the third central bank next week, the consensus expects a 25bp hike on Thursday, something that the market is currently assigning a 90% chance of happening. While the market has priced around 80% odds of a rate hike, many will be looking for signs that it won’t be a one-and-done as Brexit concerns weigh on the pound. There will be close attention on the vote count too. Should the BOE hike, this would mark the first time since 2009 that the bank rate would be above 0.5%. The latest BoE economic projections will also be released including new forecasts for growth and inflation. Governor Carney will offer an updated view on the neutral rate. In terms of the data due out next week, Friday’s employment report in the US will be the main focus. Consensus expects that 193k jobs were created in July, following the 213k print back in June. The unemployment rate is expected to fall one-tenth to 3.9% which would put it a tenth above the post-financial crisis low, while average hourly earnings are expected to come in at +0.3% mom which should keep the annual rate at +2.7%. Commenting on the market reaction, Bloomberg notes that "the jobs report will be keenly watched as always, but while the last one weighed on the dollar, it’s worth noting that Treasury market reaction in recent months has tended to be relatively fleeting." And with the unemployment rate no longer a source of signal, and at record lows, focus will remain on the increase (or decrease) in the growth rate of average hourly earnings and what that might say about inflation more broadly. There is also a fresh batch of inflation data from around the globe, where many expect a continuation of the recent tapering in rising prices. In the US we’ll get the June PCE report on Tuesday where the market expects a modest +0.1% mom core and deflator reading, the former enough to keep the annual rate at +2.0% yoy. In Europe we’ll also get flash July CPI readings for the Eurozone on Tuesday (+1.0% yoy core reading expected, up from +0.9% in June) as well as regional readings for Germany and Spain on Monday, and France and Italy on Tuesday. 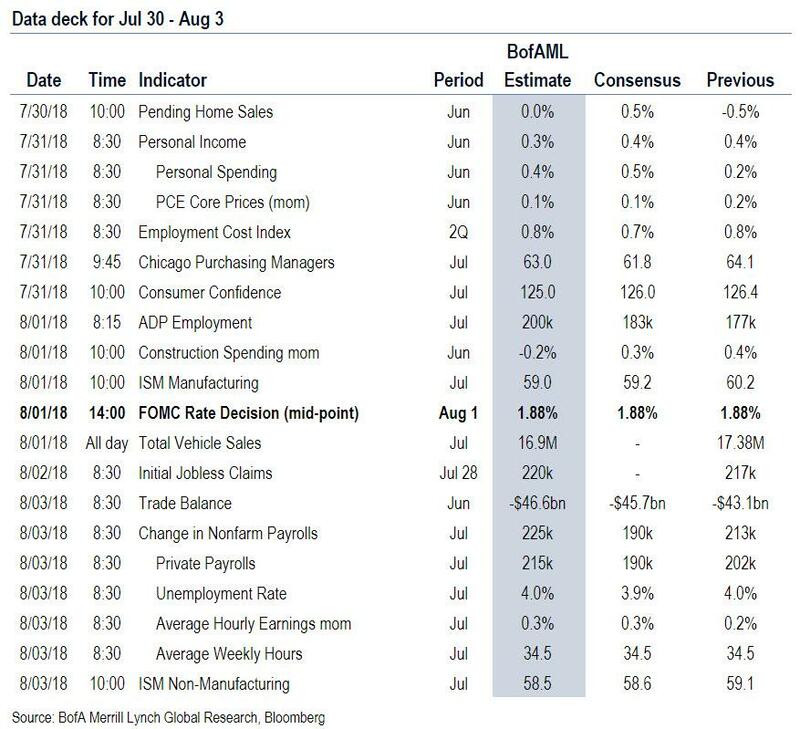 Other data to watch out for in the US next week include the July consumer confidence print on Tuesday, July ISM manufacturing report on Wednesday and July PMIs on Friday. The remaining July PMIs in Europe are also out on Friday as well as for Asia on Tuesday (China) and Friday (China and Japan). Away from that, in Europe we get the advance Q2 GDP reading for the Euro area on Tuesday, with expectations for a +0.5% qoq reading. The trade war will get another push next week when the end of the review period for potential tariffs on $16 billion of Chinese goods arrives on Tuesday. 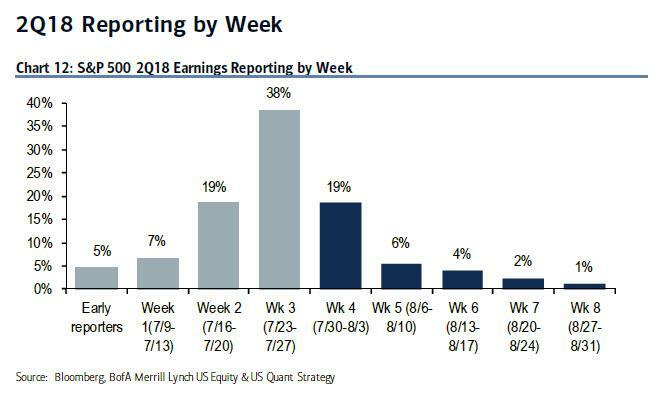 In the last busy week of Q2 earnings season for the US, we will see 145 S&P 500 companies report. The highlights are Caterpillar on Monday – which is always a good barometer for global growth – Apple, Procter & Gamble and Pfizer on Tuesday, Metlife on Wednesday, Dupont on Thursday, and Berkshire Hathaway on Friday. In Europe we’ll also get releases from Volkswagen, Siemens, BP, Barclays and Credit Suisse. Finally as Deutsche Bank's Craig Nicol points out, other scheduled events next week which could warrant keeping an eye on include President Trump hosting Italian PM Conte on Monday at the White House, UK Foreign Secretary Hunt co-chairing the China-UK Strategic Dialogue with China counterpart Wang Yi, also on Monday, Russian Foreign Minister Lavrov meeting Japan Foreign Minister Kono on Tuesday, and the US Treasury releasing its latest borrowing plans on Wednesday. Monday: It's a quiet start to the week on Monday. Overnight we get June retail sales in Japan. In Europe, we'll get the preliminary July CPI print for Spain followed by June money and credit aggregates data in the UK and July confidence indicators for the Euro area. In the afternoon we'll then get the July preliminary CPI report for Germany, while in the US the data includes June pending home sales data and the July Dallas Fed manufacturing activity print. Away from that, President Donald Trump will host Italian Prime Minister Giuseppe Conte at the White House, while earnings highlights include Caterpillar. Tuesday: All eyes on Tuesday will be on the BoJ monetary policy meeting. Datawise, we get the July GfK consumer confidence print for the UK overnight along with preliminary June industrial production for Japan and July PMIs China. In Europe, we'll get preliminary July CPI prints for France, Italy and the Euro area along with the advance Q2 GDP release for the Euro area. In the US, June PCE and the Q2 ECI data should be the main focus, while the July Chicago PMI and July consumer confidence data are also slated for release. Apple earnings will also be a big focus, while Procter & Gamble, Pfizer, BP and Credit Suisse numbers are also due. Wednesday: The big highlight on Wednesday is the Fed monetary policy meeting outcome at 19:00 BST. Prior to this, data releases include the final July manufacturing PMI for Japan and July Caixin manufacturing PMI for China. In Europe, we'll also get the remaining July manufacturing PMIs while in the US the July ADP employment change reading, final July manufacturing PMI, June construction spending, July ISM manufacturing and July total vehicle sales data are all due. Away from that, Tesla and Metlife will be reporting Q2 earnings. It's worth also noting that the US Treasury will unveil its latest borrowing plans. Thursday: The main focus on Thursday will likely be the BoE's MPC meeting outcome at 12:00 BST. It's a quiet day for data in Europe with June PPI for the Euro area the only release of note. In the US, the latest weekly initial jobless claims print is due along with June factory orders data and the final June durable and capital goods orders revisions. Away from the data, the BoJ's Amamiya will speak overnight. Earnings wise, Barclays, Siemens and Dupont will report. Friday: We end the week on Friday with the July employment report in the US. Away from that, overnight, we get the BoJ's June monetary policy meeting minutes along with July services and composite PMIs for Japan and July Caixin services and composite PMIs for China. In Europe the final services and composite PMIs are also due along with June retail sales for the Euro area. In the US, the other data includes the final July services and composite PMI prints along with July ISM non-manufacturing composite. Berkshire Hathaway will report its Q2 earnings. Finally, focusing just on the US, Goldman writes that the key economic releases this week include core PCE on Tuesday, ISM manufacturing on Wednesday, and payrolls on Friday. The statement following the FOMC meeting will be released on Wednesday. 10:00 AM Pending home sales, June (GS +0.5%, consensus +0.2%, last -0.5%): We estimate pending home sales rebounded 0.5%, following a 0.5% decline in the May report. We have found pending home sales to be a useful leading indicator of existing home sales with a one- to two-month lag. 8:30 AM Personal income, June (GS +0.3%, consensus +0.4%, last +0.4%); Personal spending, June (GS +0.5%, consensus +0.5%, last +0.2%); PCE price index, June (GS +0.07%, consensus +0.1%, last +0.21); Core PCE price index, June (GS +0.07%, consensus +0.1%, last +0.21%); PCE price index (yoy), June (GS +2.28%, consensus +2.3%, last +2.25%); Core PCE price index (yoy), June (GS +1.84%, consensus +2.0%, last +1.96%): Based on details in the PPI, CPI and import price reports, we forecast that the core PCE price index rose +0.07% month-over-month in June, or 1.84% from a year ago. Additionally, we expect that the headline PCE price index also increased 0.07% in June, or 2.28% from a year earlier. We expect a 0.3% increase in June personal income and a 0.5% gain in personal spending. Employment Cost Index, Q2 (GS +0.6% vs. consensus +0.7%, prior +0.8%); We estimate that the employment cost index (ECI) rose 0.6% in Q2 (qoq sa). While we remain constructive on wage growth, we note the possibility that larger-than-normal annual wage increases may have contributed to the cycle-high ECI growth in Q1 (+0.84% qoq ar). Accordingly, we see scope for a modest deceleration in the sequential pace (that nonetheless boosts the year-over-year rate by a tenth to 2.7%). Our wage tracker—which distills signals from several wage measures—edged up to 2.7% in Q2 from 2.6% in Q1 and 2.3% in Q4. 09:00 AM S&P/Case-Shiller 20-city home price index, May (GS +0.2, consensus +0.2%, last +0.2%): We expect the S&P/Case-Shiller 20-city home price index increased 0.2% in May, following a 0.2% increase in April. Our forecast of a modest increase reflects a slowdown of the strong trend the index has been following (now +0.5%, 3mma) relative to the more subdued pace of other home price indices. 09:45 AM Chicago PMI, July (GS 63.0, consensus 61.8, last 64.1): Regional manufacturing surveys were mixed in July, and we estimate that the Chicago PMI moved down by 1.1pt to 63.0. Uncertainty about trade policy could potentially weigh on business sentiment in this report. 10:00 AM Conference Board consumer confidence, July (GS 126.0, consensus 126.5, last 126.4): We estimate that the Conference Board consumer confidence index decreased 0.4pt to 126.0 in July, following a decline of 2.4pt in the previous month. While the index remains close to post-crisis highs, our forecast reflects a slight decrease in other consumer sentiment measures earlier in the month. 08:15 AM ADP employment report, July (GS +200k, consensus +185k, last +177k); Based on our understanding of how ADP filters its own proprietary data with other publicly available information, we expect a 200k gain in ADP payroll employment in July, partly driven by an improvement in initial jobless claims. 10:00 AM Construction spending, June (GS +0.4%, consensus +0.3%, last +0.4%): We estimate construction spending increased 0.4% in June, following an increase in May that reflected relatively firm private single family and multifamily construction but weaker commercial construction. 10:00 AM ISM manufacturing, July (GS 59.7, consensus 59.3, last 60.2): Our manufacturing survey tracker – which is scaled to the ISM index -- declined from its all-time high by 0.4pt to 60.4 following slightly softer, but still strong, manufacturing surveys in July. Industrial firm commentary in regard to sales trends has remained firm, but we do not expect the same boost that last month saw from a sharp increase in the supplier deliveries component. All taken together, we expect the ISM manufacturing index to decline by 0.5pt to 59.7. 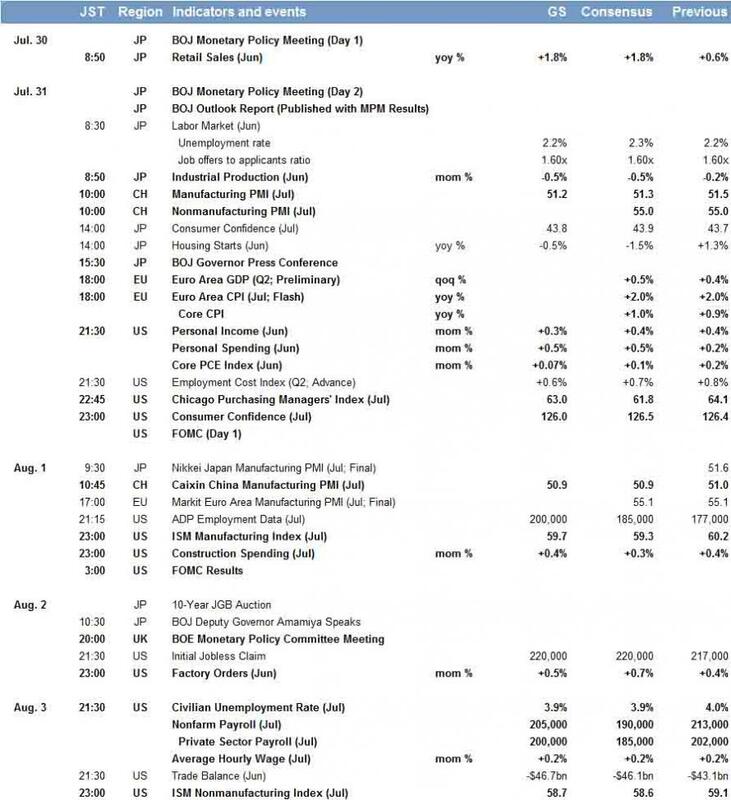 02:00 PM FOMC statement, July 31 - August 1 meeting: As discussed in our FOMC preview, we do not expect any policy changes next week and expect only limited changes to the post-meeting statement. We expect an upbeat statement consistent with a September hike, retaining most of the positive characterizations from the June meeting, given solid US growth data and stable financial conditions. 08:30 AM Initial jobless claims, week ended July 28 (GS 220k, consensus 220k, last 217k); Continuing jobless claims, week ended July 21 (last 1,745k): We estimate initial jobless claims increased by 3k to 220k in the week ended July 28, following a 9k increase in the previous week. The trend in initial jobless claims appears to be declining, and the auto plant shutdowns have led to major spikes in layoffs over the last few weeks. 10:00 AM Factory Orders, June (GS +0.5%, consensus +0.7%, last +0.4%); Durable goods orders, June final (last +1.0%); Durable goods orders ex-transportation, June final (last +0.4%); Core capital goods orders, June final (last +0.6%); Core capital goods shipments, March final (last +1.0%): We estimate factory orders rose 0.5% in June following a 0.4% increase in May. Headline durable goods orders were strong in the June advance report, largely driven by an increase in non-defense aircraft orders. Core measures were solid, with increases in both core capital goods orders and core capital goods shipments. 8:30 AM Nonfarm payroll employment, July (GS +205k, consensus +190k, last +213k); Private payroll employment, July (GS +200k, consensus +185k, last +202k); Average hourly earnings (mom), July (GS +0.2%, consensus +0.2%, last +0.2%); Average hourly earnings (yoy), July (GS +2.6%, consensus +2.7%, last +2.7%); Unemployment rate, July (GS 3.9%, consensus 3.9%, last 4.0%): We estimate nonfarm payrolls increased 205k in July. Our forecast reflects new lows in initial jobless claims and continued strength in service-sector employment surveys. We expect the unemployment rate to partially reverse its June increase, falling a tenth to 3.9%. While continuing claims rebounded during the payroll month, the June participation rate was at the high end of its multi-year range, and we expect it to drift lower in coming quarters. Finally, we expect average hourly earnings to increase 0.2% month over month and 2.6% year over year, reflecting unfavorable calendar effects. 8:30 AM Trade balance, June (GS -$46.7bn, consensus -$46.1bn, last -$43.1bn): We estimate the trade deficit widened by $3.6bn in June, reflecting a similar widening in the goods trade deficit in the Advance Economic Indicators report last week. 10:00 AM ISM non-manufacturing, July (GS 58.7, consensus 58.6, last 59.1): We expect the ISM non-manufacturing index to decline by 0.4pt to 58.7 in July. On net, our nonmanufacturing survey tracker moved down 0.5pt to 58.1, reflecting a general softening of service-sector surveys.